MARCOM's "Dealing with Drug and Alcohol Abuse... for Employees" Safety Meeting Kit explains to employees the various types of substance abuse that are found in the workplace, how they can affect an employee's work situation and what employees themselves can do to help keep their workplace drug and alcohol free. Substance abuse in a huge, worldwide problem. An employee with an alcohol or drug problem can decrease productivity, create a hostile working environment and damage a company's good name. Worst of all, the actions of a worker who is "under the influence" can completely undermine a company's efforts to keep people safe. Materials in the kit include a video program, five motivational posters, and 30 employee booklets. The posters in the kit remind employees to help keep there workplace drug and alcohol free. 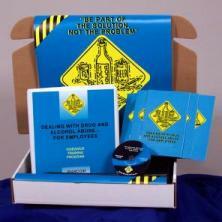 The video program and employee booklets include information on how substances are typically abused by employees, alcohol and other depressants, and their effects, stimulants, narcotics and hallucinogens, and their effects, alcohol and drug policies, helping people overcome substance abuse, and more. The video program in the kit comes with a comprehensive leader's guide, reproducible scheduling & attendance form, employee quiz, training certificate and training log.